Advertise your Head Teacher and leadership roles in the new dedicated leadership section within the TES Magazine. 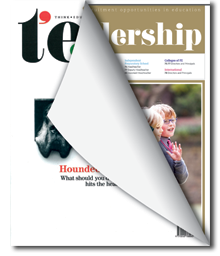 All leadership jobs in print have moved from the TES jobs paper to form a new recruitment section within the TES Magazine. TES LEADERSHIP is the latest bespoke recruitment solution in the TES portfolio. New dedicated leadership section seen by an average 362,000* readers every week. Wider reach of active, passive and aspirational jobseekers, by appearing in a magazine they read cover to cover. High quality, full colour adverts to reflect the importance of leadership roles and their contribution to the success of the school. Stronger brand representation for your school with quality ads for leadership roles. Find the next generation of leaders. Attract the largest number of high quality candidates. 020 3194 3050 or email recruitment@tes.co.uk.